Adventures by Disney offers tours of several destinations worldwide. In the Quest for the West tour, groups of 27 to 40 travelers spend seven days guided by two Adventures by Disney guides through western Wyoming. They visit Jackson Hole, the Grand Tetons, and Yellowstone, and finally, a dude ranch in the foothill of the Pinacle Buttes near Dubois. Guests stay in specially selected accommodations, with Disney-partnered local vendors providing first-class opportunities to provide unique experience at these destinations. Leading up to our trip, I received feedback from various sources regarding such a tour. Some people hesitated or even balked at the price point. Others expressed concern that traveling with a group of strangers would feel uncomfortable. Still others felt reluctant to turn over control of touring plans, timing, and destinations to tour guides and bus drivers. At this point, I must confess: I agreed with every single one of these objections. With that said, seeing is believing. After experiencing five days in Wyoming with an Adventures by Disney team, I have a changed perspective. As one Adventure Guide summed up: "For some families, an Adventures by Disney tour will be a once-a-lifetime vacation. They may save up for a long time for a trip. Others may have the means to return for several vacations." After our trip to Wyoming, I can confidently report that either way, Disney truly offers an amazing adventure. 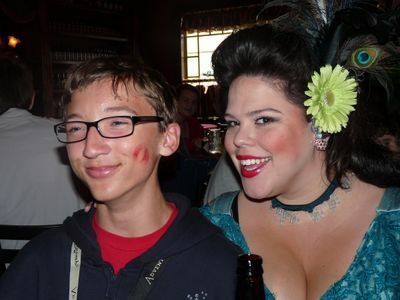 Along the way, I learned a few lessons about the Quest for the West trip. Admittedly, I am embarrassed to report that our trip began with a road block and a panicked mother. Our airline delayed our 7:00 a.m. flight out of John Wayne Airport in Orange County, California, by four hours to fix a bad tire. As an infrequent flier, my biggest flying and logistics anxieties came to life in an airline terminal. The airline was able to rebook our connecting flight to Jackson Hole, so I immediately contacted the Adventures by Disney concierge to update my flight information and ensure that the team in Jackson Hole would know when to pick up my family at the airport. Instead of arriving at noon, we landed that evening, six hours late. 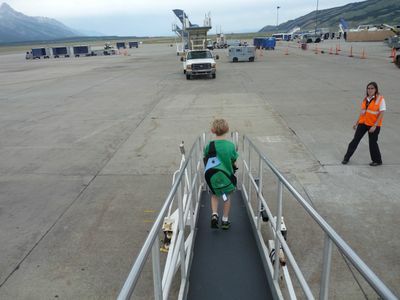 Colin Krock is the first to deplane in Jackson Hole, Wyoming. Jackson Hole Airport is the only airport inside a National Park. Photo by Adrienne Krock. Suffice it to say, when we finally stumbled into Jackson Hole’s historic Wort Hotel after 12 hours in airports and airplanes, you could have stuck a fork in me: I was done! No words can express the overwhelming relief I felt when our Adventure Guides Tiffany and Drew greeted us in the hotel lobby. Drew quickly escorted the boys into the welcome gathering and dinner already underway. Tiffany knew exactly what to say and do to assure me they had everything under control. As the hotel staff whisked our luggage away and Tiffany took care of me, for the first time all day, I felt peaceful. A six-hour cushion was too short. I wish I had flown into Jackson Hole with the boys the day before our tour began. Technology is magical. Via Twitter and text messages, my very good friends and experienced fliers virtually held my hand, giving me information that helped me negotiate our flight changes. The airline’s reservation phone representative could not adequately reschedule our flights, mostly due to the size of our group. When I called the Disney travel agency who booked our flights, they encouraged me to work directly with the airline in person to adjust our flights. Delta employee Diane at John Wayne Airport: Thank you for everything you did for my family. Flying in First Class with my 8-year old from Salt Lake City to Jackson Hole was not necessary, but it sure was nice. The Disney contracted outside shuttle service had a minor hiccup when they picked up my family at the airport. I typically hesitate to complain in any situation, and after my very long day, I elected to not tell the Adventure Guides about the problem. When I did mention the incident near the end of our trip, they were very disappointed that I had not let them know earlier. Lesson learned: If you ever have a less-than-perfect experience with a vendor, let the Adventure Guides know immediately so they can address the issue with the vendor as appropriate. In Jackson Hole, Disney planned for us to tour the town, have lunch at the Playhouse Theater, take a Whitewater rafting trip, and enjoy dinner on our own. They filled our day with fun. Matthew Krock proves to be a good sport as the performers at Jackson Hole's Playhouse Theater immerse Adventures By Disney guests into their private performance. Photo by Adrienne Krock. At the Playhouse Theater, our group enjoyed a private, exclusive behind-the-scenes tour of the stage and scenery for the summer musical production of "Cat Ballou." The cast then served us a lunch and entertained us with interactive musical numbers taken from their production. They even included my boys in the experience. Adventure Guide Drew and Spencer Krock float alongside their raft in the Snake River. Photo by Adrienne Krock. After lunch, we departed on our big adventure of the day: Whitewater rafting on the Snake River. While my children anticipated this more than any other item on tour schedule, I took a leap out of my comfort zone to participate. The verdict? As they say in Wyoming, “Yee-Haw!” We had a blast shooting the category I–III rapids. That night, we enjoyed a dinner on our own. On the advice of a local friend and with some back-up from Twitter, my family dined at the Gun Barrel Restaurant. If you happen upon Jackson Hole on a Saturday morning, do not miss the Farmer’s Market in Town Square. My biggest regret in Jackson Hole: We did not know about,and thus missed, the Jackson Hole National Park Visitors Center, a short walk from the Wort Hotel. Other guests on our tour visited in the morning before the Playhouse Theater tour. For parents with children too young to experience the whitewater rafting trip or those who would rather not whitewater raft, Disney offers an alternate "float"—a boat trip with a meal at the end of the trip. “All-inclusive” means just that: Disney’s rafting vendor includes wetsuits and booties for everyone who wants them on the Adventures by Disney tour. With water temperatures in the low 50s and rain sprinkles, our wetsuits kept us warm. The Adventure Guides coordinate with the hotel to provide towels to dry off at the end of the ride. The waves at the front of the boat overwhelmed my 8-year-old son in the first row of the boat. He handled the ride much better once we moved him further back in the boat. Adventure Guides are awesome. Our Adventure Guide, Drew, rode on our boat, and when the rafting guide gave us permission to jump in the river, Drew offered to join anyone who wished to try. My 11-year-old accepted the challenge. 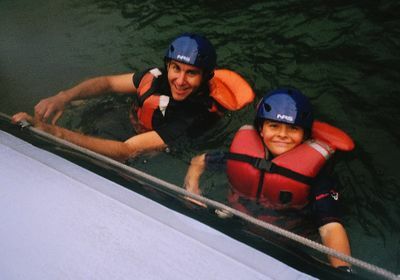 I was both amazed and proud of my son’s courage and adventurous spirit. Only one other adult in our boat eventually joined them. I hit the bull’s eye when I purchased three disposable waterproof cameras at the last minute before our trip. The boys and I took several memorable pictures on our whitewater rafting trip. For the whitewater trip, we wore bathing suits under our wetsuits. I brought a T-shirt and lightweight shorts to pull over my wet bathing suit after the ride. This worked well for after I took off my wetsuit at the end of the ride. My boys stayed in their rash guards and swim trunks until we returned to the hotel. If you make dinner reservations following the whitewater rafting, make them no earlier than 7:00. The Adventures by Disney concierge advised me before my trip that 6:00 would be late enough, but our rafting excursion ran late. The Adventure Guides called ahead to adjust our dinner reservation to 7:00 and also called to have a taxi pick us up from our hotel. We enjoyed The Gun Barrel Steak & Game House very much. Be aware that it requires taking a free town shuttle or a cab ride from the Wort Hotel to get there. We especially enjoyed the bison carpaccio, and the buffalo prime rib was amazing. As a self-proclaimed National Park fan girl, I thought for sure that a tour group could never meet my expectations for visiting a National Park. Our Adventure proved me wrong. Adventure Guides lead guests on a hike to Hidden Falls hike in Grand Tetons Park, including breathtaking views of cascades. Photo by Adrienne Krock. The Adventures by Disney schedule in Wyoming includes several experiences in the Grand Tetons and Yellowstone; enough that even a National Park fan would leave feeling sufficiently experienced. The Quest for the West tour includes majestical views of the Grand Tetons with boat rides across Jenny Lake to hike to Hidden Falls, a visit to the Grand Tetons Visitor’s Center, lunch on Leigh Lake, and more. In Yellowstone, guests enjoy West Thumb Geyser Basin, Old Faithful and the surrounding geysers, the Grand Canyon of Yellowstone, Grand Prismatic Spring, Paint Pots, and all of this with the tour guide expertise and services of the Adventures by Disney guides. Clearly, the Adventure Guides prepare for these tours through extensive research and studying. 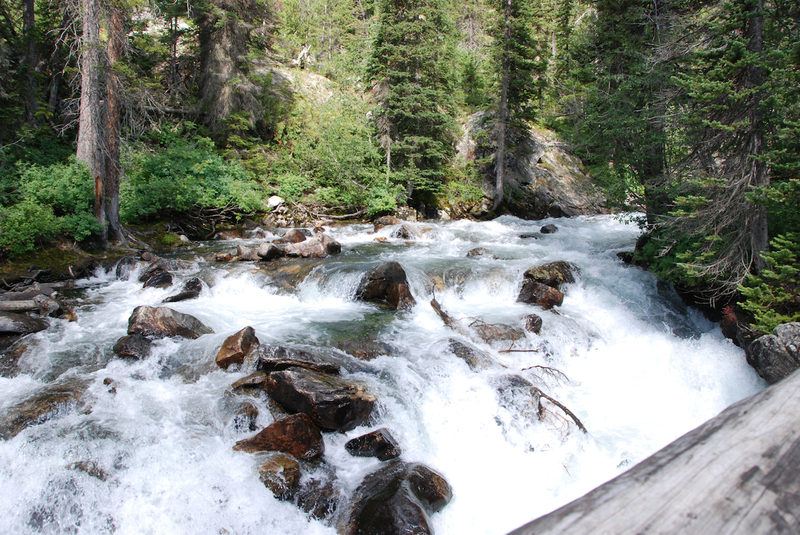 Throughout our hike to Hidden Falls in the Grand Tetons, exploring the geysers and mineral springs of Yellowstone, and our bus rides between expeditions, Tiffany and Drew provided a wealth of background, history, and information about the sights we saw. At our stops, my sons and I pulled out our National Park Passports and stamped them at the Visitor Center stations. On our ride to Yellowstone, the Adventure Guides called the park to know when Old Faithful would erupt that afternoon. Matthew and Spencer Krock watch Old Faithful blow, right on schedule. Photo by Adrienne Krock. Once at Old Faithful, Tiffany and Drew brought out their laser thermometers so that children (and adults) could safely interact with the wonders of Yellowstone. Everyone enjoyed testing the temperatures of the mineral hot springs and geyser run-off. Because they visit so often, the Adventure Guides know the ins and outs of timing visits to the geysers; their knowledge is a treasure for their guests. Many Disney fans know that the Wilderness Lodge at Walt Disney World is modeled after the Old Faithful Inn at Yellowstone, so they often wonder why Adventures By Disney tours do not stay at that Inn. While historic, many of the rooms at the Old Faithful Inn share bathrooms—which does not meet the high standards set by Adventures by Disney. Adventures guests stay at the Snow Lodge just next door to the Old Faithful Inn and Visitor’s Center, just steps away from the famous geyser. If, like my family, your children enjoy the Junior Ranger programs at the National Parks, let your guides know if they do not mention them first (although they probably will). The guides will let you know the opportunities to participate in these activities well within the Adventures by Disney schedules. Bring your National Park Passports to get them stamped. If you do not have one already, the Park Visitor Centers have them available for purchase. 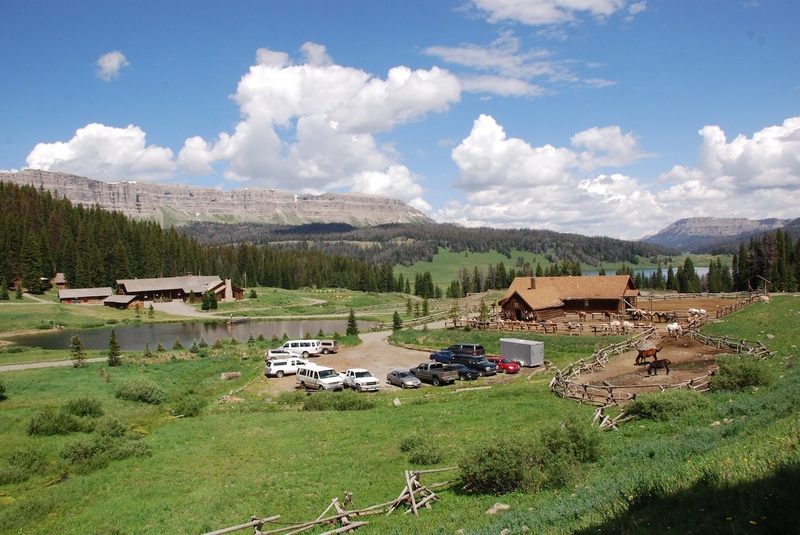 Finally, our tour led us to the Brooks Lake Lodge near the Pinacle Buttes, along the Continental Divide, outside Dubois, Wyoming. Adventures By Disney pulls out all the stops with this resort. The staff is phenomenal and typically, the Adventures by Disney guests have exclusive use of the resort during their two-night stay. The Brooks Lake Lodge, with stables in the foreground, as seen from atop "Jersey" on a horseback ride along the cascade trail. Photo by Adrienne Krock. The Lodge carefully matches guests with rooms or cabins best suited to their group's needs. Upon arriving at the lodge, General Manager Adam welcomed us and introduced each group to staff members who escorted us to our rooms or cabins. For our family, the lodge staff selected the Judges cabin. This cabin featured two bedrooms, two baths and a main living area with a wet bar counter. One bedroom had two twin beds, and the living room was set up with a deluxe air bed so that each of my sons had his own bed. The queen bed in my room boasted a lovely red, white, and blue handmade quilt. All the beds had quilts, with down comforters available for cool evenings. A lawyer’s case in the living area displayed several books, including some children’s novels as well as games and puzzles. My boys especially enjoyed a 1950s edition of the Scout Field Book. I moved several of the complimentary water bottles off the countertop into the refrigerator. We even had a microwave. I had to tell the boys to leave the judge’s gavel in the living area alone after the first few minutes. My favorite feature of our cabin, besides the porch with amazing views of Brooks Lake and the Pinacle Buttes, were the wood stove and two enamel water pots that served as both our heater and room humidifier. I asked Adam for instructions on using the wood stove—it was lovely to fall asleep each night to the glow of a wood stove. 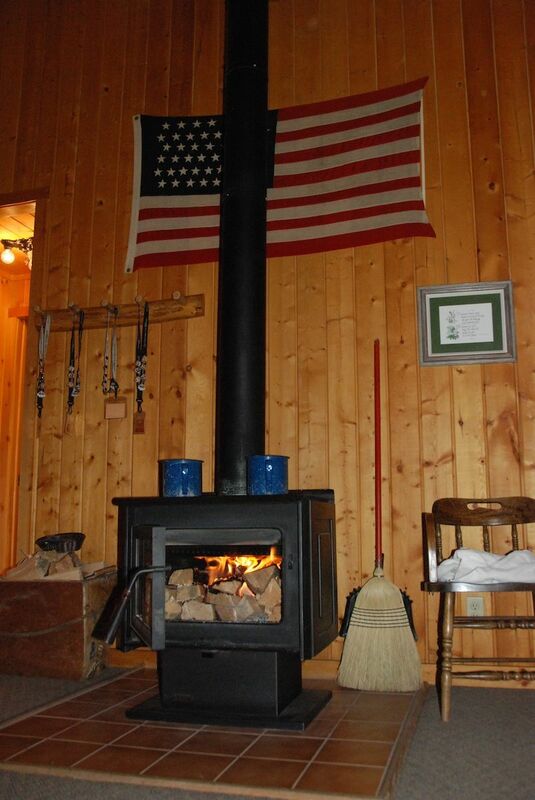 This wood stove provides heat to the Judges cabin, and the enamel pots on top serve as room humidifiers. Photo by Adrienne Krock. After touring our cabin, our family signed up for the next day’s activities. We planned a morning horseback ride together as a family. Our wonderful wrangler, Courtney, gave us a bonus trip to Barber’s Point where we could view the Wind River Mountains far to the east. Because my boys are all over 7 years old, they were able to participate in some classes without me. They selected fly fishing in the afternoon, while I took a photography class. Other activity options include canoeing, a hike to the summit of Brooks’ Mountain, and more. Guests also had access to the sauna, 20-person Jacuzzi, and fitness room. For an additional fee, the lodge had massages available at the spa. The lodge offers a kid program for younger guests, as well. Some of the children in our group participated in this while their parents were on long horseback rides, on an intensive guided hike, or enjoying a massage. During our stay, culinary artist Chef Antonia (an-toe-NEE-ya), and her magical pastry chef Angel provided our group with amazing meals that featured such selections as trout, salmon, grilled portobello mushrooms with homemade spinach ravioli, game, lavender and honey glazed Cornish game hens, buckwheat pancakes, omelet bar, peach blueberry crisp, homemade lemon cake, tea-time cookies with cheese plates and fresh fruit, grilled vegetables, and so much more. In the afternoon, we enjoyed a lovely tea time service with hot tea, iced tea, lemonade, fresh fruit, a cheese tray, and homemade chocolate chip cookies. The chefs specially accommodated guests with special dietary needs. Chef Antonia carefully cultivates a special kitchen garden, and especially enjoyed serving us salads with pansies on our first evening at the lodge. In the evenings, the children sat at the “kid’s table” with our Adventure Guides and enjoyed evening programs. The first night was movie night for the children, and on the second night, the general manager himself helped serve up s'mores by a campfire before a rousing game of Capture the Flag. Tiffany and Drew warned us that we would never want to leave the Brooks Lake Lodge, but no warning could prepare us for our experiences there. This lesson extends throughout the entire trip: I found myself completely unprepared for how dehydrated we became on this trip. Even with the occasional rainfall, the atmosphere was arid. We needed to constantly drink water and hydrate with lip balm and lotion. Jackson Hole is 6,400 feet above sea level and Brooks Lake Lodge is at 9,200 feet in elevation. When the hotels provide humidifiers in the rooms, use them. The lodge recommended that adults drink at least one glass of water with each alcoholic beverage they consumed. I wished I packed more cool weather clothes. I'd only brought one thin zipper jacket; I should have brought some long-sleeved shirts or more layers to keep warmer in the evenings, and a heavier jacket or sweater. For whatever reason, I never thought to ask about helmets for our horseback ride. The lodge never suggested them nor offered them. In fact, the Brooks Lake Lodge does have helmets available to wear during horseback rides, but you may have to be proactive in asking for them. I missed the tip to bring bug repellant. At last count, I only have about four to six good-sized bites. Several guests took advantage of the spray at the lodge. I gambled and itch a little as a result. Having experienced the Quest for the West, I have a new perspective on touring with Adventures by Disney. Now I want to study this Adventures By Disney catalog and pick a destination I have yet to explore. My family may not be the type to revisit Adventures By Disney destinations each year or two, but I wonder how much fun we could have if we set a goal and saved for a few years for a complete Adventures by Disney experience. That said, my children and I definitely agree on one thing: From now on, no matter where we go on vacations, we want Tiffany and Drew to come with us. Great article. I really liked the waterfall shot. Reminds my of the 3 day hike my troop and I took in the Canadian Rockies back in the late 70s (20 miles downhill on a sprained ankle - UGH!). Beautiful! Seems to me that Disney really focused on the "experience" portion of this kind of trip, similar to what I read about cruises, etc. I sometimes wonder if this type of environment will hit the theme parks (some say it already has with pricing) but for those that can afford it I would assume it's the only way to go if you want planning-free, exciting experiences. Excellent article but I'd expect nothing less. Loved the pics of the boys doing such amazing things. I enjoyed the article as well. It really cemented in my mind that this is a first-class way to do a trip to one of the areas covered. Can it be done cheaper on your own, heck yea, but a heck of a lot of work to get the most value for your vacation time. I wouldn't do something like this to go somewhere I'm familiar with, but for a trip to someplace new - hands down. There's a lot of peace of mind to be had knowing that EVERYTHING is taken care of.